BMW Group Malaysia today introduced the new BMW 3 Series, which in its sixth generation is as impressive as ever with an irresistible combination of dynamic design, unrivalled agility and excellent everyday practicality. The sporty-elegant exterior of the new BMW 3 Series begins with newly redesigned headlights which dominates the front to provide an even more vivid visual representation of the car’s dynamic flair. LED indicators are now positioned as “eyebrows” above the all-LED headlights, featured as a standard and are integrated in a noticeably more horizontal form. The shape of the LED daytime running lights on each side meanwhile further highlight the hallmark BMW twin headlight arrangement and create a stylistic link between the headlight units and the BMW kidney grille. Below the headlights sit the LED fog lights, a standard feature for the new BMW 320i M Sport, BMW 320d M Sport and BMW 330i M Sport variants. 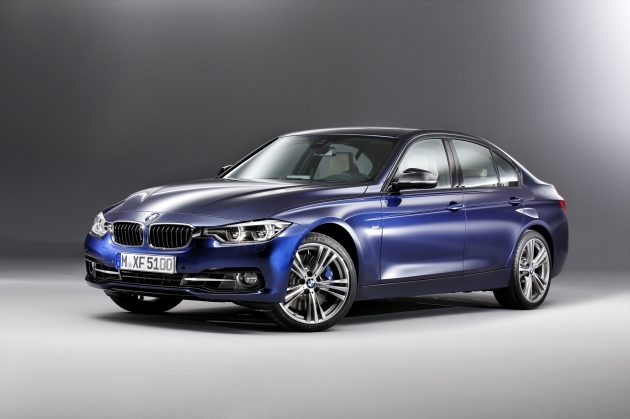 The flanks of the new BMW 3 Series meanwhile continues to exude the strong visual presence of the car. The front apron receives broader side air intakes lending an even stronger stylistic presence. The rear of the new BMW 3 Series is just as eye-catching. The newly redesigned rear lights are also full-LED units, arranged in distinctive BMW “L” shape and is now more heavily curved. The two LED indicators form a horizontal band of light across both sections of the rear lights and provide extremely even and consistent light. The sporting appearance of the new BMW 3 Series is further complemented by twin tailpipes measuring 70 millimetres in diameter for the new BMW 320i, BMW 320d and BMW 330i while the new BMW 318i receives a larger single tailpipe with a diameter of 75 millimetres. The new BMW 3 Series also arrives with a new range of wheels: the BMW 318i Luxury Line with 17” light alloy Multi-spoke wheels, the BMW 320i Sport Line with 17” light alloy Multi-spoke V wheels, the BMW 320i M Sport and BMW 320d M Sport with 18” M light alloy Star-spoke wheels, and 18” M light alloy Double-spoke wheels for the BMW 330i M Sport. The BMW 3 Series has symbolised driving enjoyment combined with frugal fuel consumption for the past 40 years. 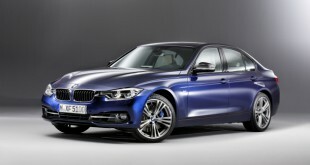 Now the new BMW 3 Series is raising the bar yet again. All members of the new modular engine family share a common design blueprint with an inline cylinder arrangement and will benefit from the BMW TwinPower Turbo technology. The arrival of the new BMW 3 Series also marks the world premiere of the new 2.0-litre 4-cylinder petrol engine, equipped in both the new BMW 320i and the all-new BMW 330i. The engine guarantees maximum driving pleasure thanks to agile power delivery and outstanding responsiveness at low engine speeds, all while being exceptionally fuel efficient and low in emissions. This engine is part of the BMW EfficientDynamics range and generates in the BMW 320i, an output of 184 hp, torque of 290 Nm and accelerates from 0 to 100 km/h in 7.2 seconds while in the BMW 330i; an output of 252 hp at a maximum torque of 350 Nm and an acceleration speed of 5.8 seconds from a standstill to 100 km/h. This powerful and especially lightweight all-aluminium engine not only provides excellent performance and exemplary BMW refinement, but also exemplary fuel efficiency. The average fuel consumption reading of the BMW 320i and BMW 330i stands at 5.58 litres per 100 km and at 6.1 litres per 100 km respectively. C02 emissions level meanwhile is at 128 g/km from the BMW 320i and 143 g/km from the BMW 330i. The new BMW 320d features the latest 4-cylinder diesel engine which delivers maximum driving pleasure at an output of 190 hp and maximum torque of 400 Nm. It also boasts impressive acceleration power of 7.2 seconds from 0-100 km/h and has a fuel consumption reading of 4.0 litres per 100 km while C02 emissions stand at 106 g/km. Another component essential to reducing CO2 emissions is the new eight-speed Steptronic transmission and with the navigation system, an additional anticipatory drivetrain system can be opted for to further reduce fuel consumption and emissions. The BMW 3 Series has been the benchmark in driving dynamics for generations and as the epitome of sportiness, superior agility and a dynamic driving experience, the new BMW 3 Series has a stiffer suspension thanks to fine-tuning of the damping system. This results in an especially precise steering system with even more sensitive road feedback. The improved overall harmonisation of all chassis variants also provide an even more dynamic driving experience and improved cornering behaviour while maintaining the same unparalleled ride comfort. The sporting credentials of the new BMW 3 Series can be further accentuated with the M Sport suspension available for the new BMW 320i M Sport and BMW 320d M Sport, while the Adaptive M Suspension is made available for the all-new BMW 330i M Sport. The interior of the new BMW 3 Series faithfully reflects the dynamic and elegant lines of the sporty model range. The cockpit’s driver orientation is a signature BMW feature and provides optimum access to all the important functions. The outstanding ergonomics of the new BMW 3 Series have been enhanced to feature high-quality chrome accents for controls and air vent surrounds and high-gloss surfaces along the top of the centre console for an even classier look. With the optional interior lighting package, an ambient lighting surrounds the upper control area in the centre console. The cupholders in the centre console adds a practical feature to the new BMW 3 Series and now have sliding covers. More centrally placed seat belt locks meanwhile reduce the risk of “submarining” and make for easier installation of child seats on the rear seat bench. BMW has been setting the standard for connectivity between human, car and the outside world for many years now. In the new BMW 3 Series, BMW ConnectedDrive is providing another impressive demonstration of its pioneering abilities while again ensuring supreme safety, comfort and infotainment. A SIM card built into the vehicle enables customers to enjoy optimum connectivity and access to the unrivalled range of services from BMW ConnectedDrive without the need for a smartphone. The Concierge Service for example, makes it possible to select points of interest while driving, such as restaurants or hotels, make a reservation if desired, and have them sent straight to the vehicle as a navigation destination. Intelligent Emergency Call, another standard feature in the new BMW 3 Series, ensures maximum safety on the road. If the airbags are triggered in an accident, this system uses the built-in SIM card to automatically transmit the severity of the accident, the potential risk of injury to the occupants and the vehicle’s location to the BMW Call Centre. This information is then used to arrange the best possible emergency response while the Call Centre stays in contact with the occupants if desired. The manual emergency call function also allows rapid help to be summoned for other road users in emergency situations. The all-new BMW 318i Luxury Line is availble in Alpine White, Black Sapphire, Mineral Grey, Imperial Blue and Platinum Silver; the new BMW 320i Sport Line in Alpine White, Mineral Grey, Glacier Silver, Melbourne Red and Mediterranean Blue; while the new BMW 320i M Sport, BMW 320d M Sport and the all-new BMW 330i M Sport in Alpine White, Black Sapphire, Mineral Grey, Glacier Silver and Estoril Blue. The range of Leather Dakota upholstery colour choices include Black, Saddle Brown and Oyster/Black.